I struggle to eat enough fruit! 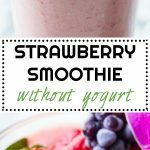 This Strawberry Smoothie Without Yogurt makes it easy peasy to dump 2 servings of fruit in one go. I love vegetables to death! All of them. They all taste like glory to me. Fruits taste great once I have them in my mouth but for some reason, I hardly ever crave them. Am I the only one? I had to come up with a way of consuming more fruit and this smoothie made it really easy for me. I’m more of a protein-rich green smoothie type o’ gal. Just strawberries, which are low in sugar and high in vitamin C would have been great but it made the smoothie super sour. Adding sweeteners to a fruit smoothie isn’t the smartest idea. It’s already high in fruit sugar. The best way is to choose 1-2 high fructose fruits and use those as a sweetener. I chose a banana and it worked wonderfully. Since I froze it and added a ton of strawberries it didn’t taste all banana-y. It tasted mostly like sweet strawberries. Awesome! 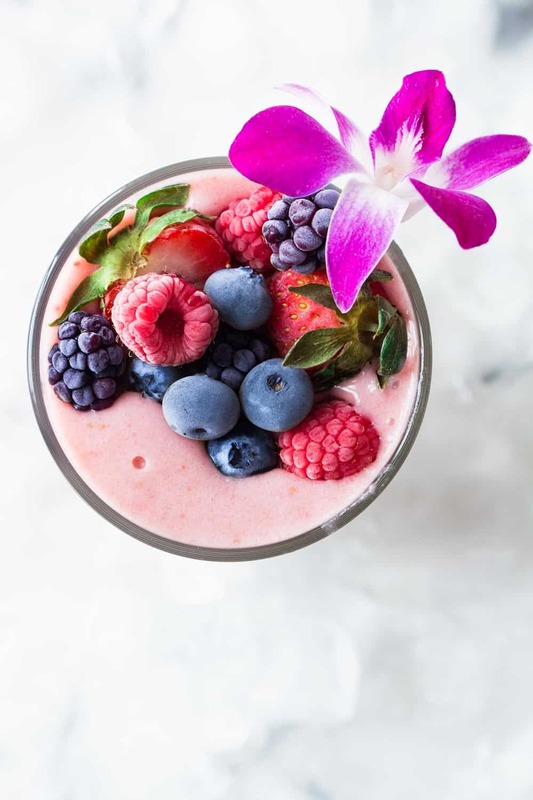 Adding ice to your smoothie is great for consistency BUT once it melts it waters down the smoothie and makes it tasteless. Freezing one or all your fruits is much smarter. You get the smoothie-like consistency without losing taste. Most smoothies use either yogurt or juice and ice as a base to make it creamy. You don’t have to choose one or the other though. Juice spikes up the fruit sugar content unnecessarily so always try and stay away from smoothies based on juice. Yogurt is a great source of protein if you don’t have any dairy tolerance issues. If you do, however, you don’t have to go for the juice option. There is other ways. You can use coconut milk for example to obtain that “creamy” texture and flavor. I use light coconut milk for my smoothies so they don’t sit in my stomach too heavy. If you don’t like the creamy taste of smoothies and rather the freshness of them. You can simply replace “milk” (whatever kind that might be) by water. You can replace not only milk but also yogurt with simply water if you don’t fancy “creamy” in your smoothie. 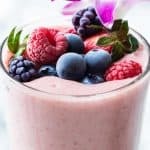 Are Strawberry Banana Smoothies healthy? 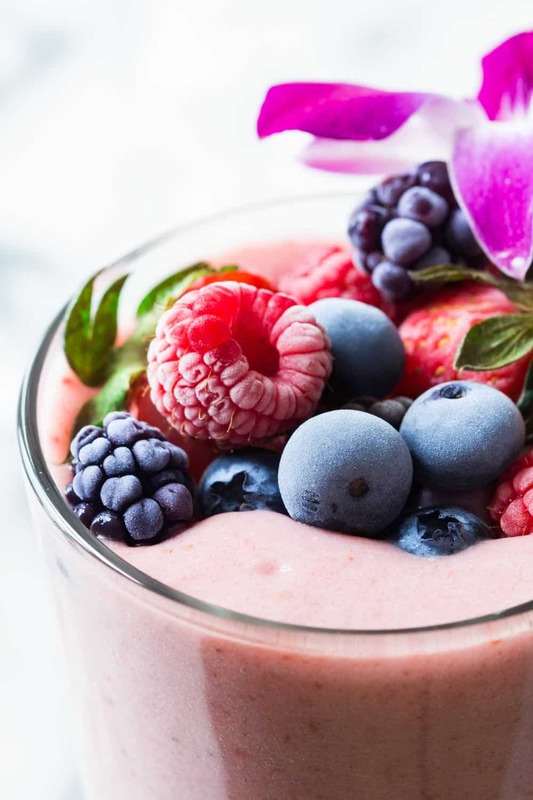 Many will argue that fruit-only smoothies are not the healthiest. Here is the thing. Adding vegetables to your smoothies is super smart and healthy. Keeping the sugar content down is smart and healthy….IF you don’t already eat a ton of vegetables. I eat vegetables like a machine. Fruits, not so much. I struggle to eat enough fruit. It basically the only food group I struggle with. Vegetables no problem. Protein no problem. Carbs no problem. Fruit….argh, I have to eat more than an apple slice a day?? 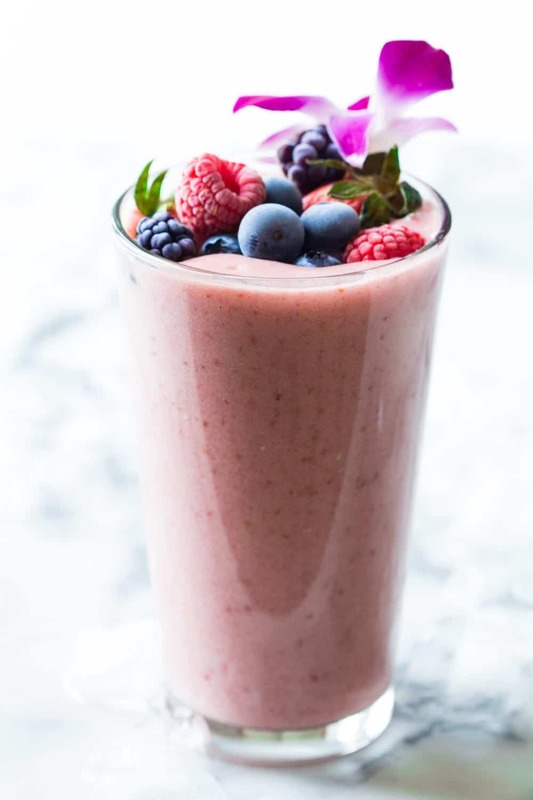 This Strawberry Smoothie without yogurt and without milk sweetened with only banana has gotten me to get in so much more fruit in a day and I serve a tiny glass of it to my kids as dessert and they LOVE it. So I guess it depends on how you look at it. For me, the trick is to make the fruit very presentable. The prettier the presentation, the more I eat/drink. This Strawberry Smoothie Without Yogurt worked for me because I “beautified” it with frozen berries on top. I look at it with hearts in my eyes and then dump it. I guess that’s called auto-brain-washing, haha. Another way that works great for me is a pretty fruit platter. I’ve got tons of tips on how to arrange a beautiful fruit platter. If you don't have frozen bananas yet, PEEL THEM, and then freeze them for at least 4 hours. I wrap them in parchment paper to avoid from sticking to anything or each other. Wash and hull strawberries, add hulled strawberries, bananas and coconut milk to blender and blend until smooth. How does a smoothie have 36 grams of fat?? Lol, I’ve never tried Katherine. I tend to have frozen bananas in the freezer all the time because as soon as they have one brown spot kids refuse to eat them anymore so up they go peeled into a silicone freezer bag and freezer. It’s definitely worth a try though. I would probably try reduce the milk proportion and replace half by ice cubes. You’d need a powerful blender though to make it work. You can but the smoothie will be less creamy and sweet. I’m lookjng to make a frozen strawberry banana smoothie with out coconut milk or yogurt…..possible? Can’t I just substitute the coconut milk with regular vitamin d milk? 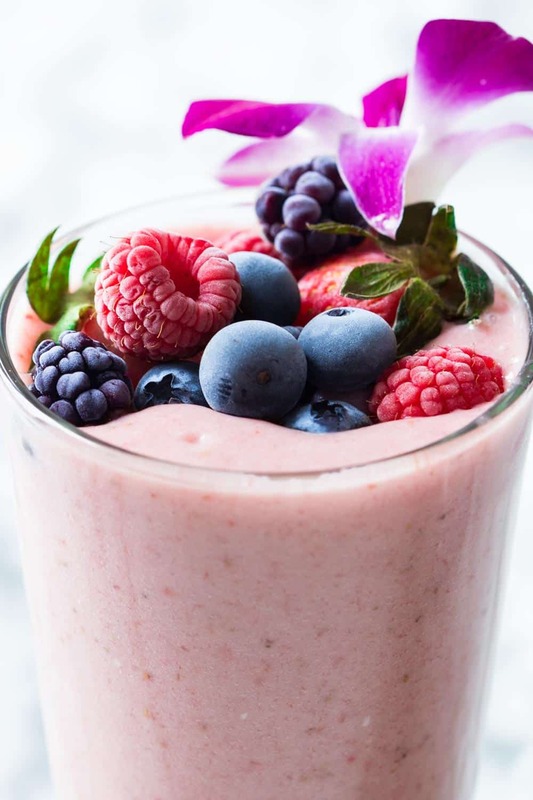 Right now I’m blending a hand full of small frozen strawberries n half handful of slived frozen bananas and then pouring in small amounts of vitamin d milk so it will blend….. hoping this turns out…. any suggestions? To get it…more filling have you ever added oatmeal or flatseed? I keep hearing those are good to add. I peel and slice bananas and place them on a parchment lined cookie sheet and freeze. Once frozen, they are put in a Zip Lock bag. My Ninja likes the small pieces better than whole bananas.